Mary Simon-Casati’s Smashing the Invisible, on view through February 10th, peers into the unknown and unseen in the universe. Even before you notice the wall vinyl quotations from Carl Sagan and Neil deGrasse Tyson, there’s a sense of the cosmological in Mary Simon-Casati’s exhibition of new paintings and glasswork. 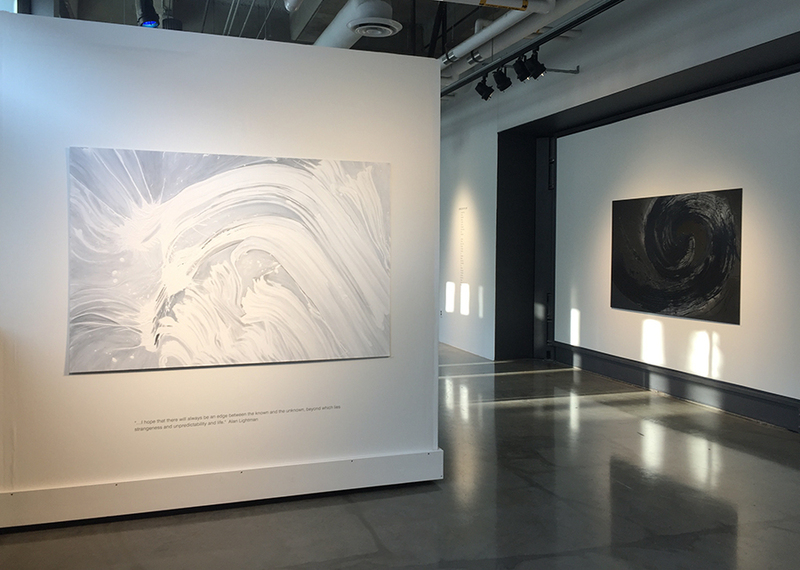 The work is elemental, each painting either pitch black or titanium white, a series of monochromatic meditations on the violence of a brushstroke. 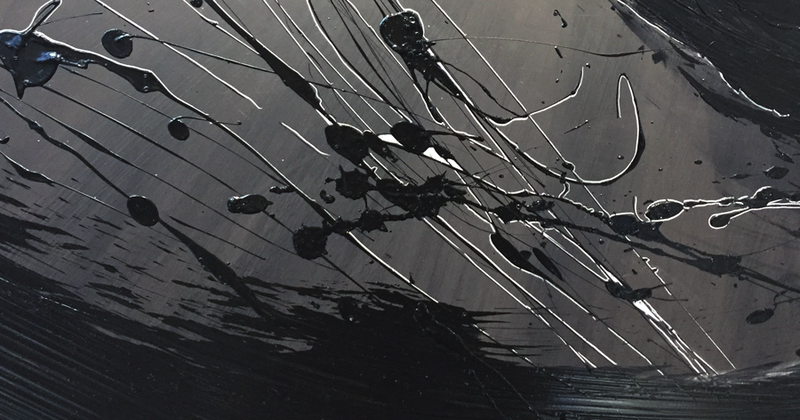 Crashing waves of paint, glossy and splattered, twist and coil on thin aluminum panels. From a distance they’re like windows onto the void, so flat they’re almost cut out of the wall. Spiral, mixed media on aluminum, 48 x 72”. Photo courtesy of the artist. There’s a severity and an elegance to the paintings, a simplicity of motion on a scale that points to forces bigger than ourselves. With the help of a 2017 Artist Initiative Grant from the Minnesota State Arts Board, Simon-Casati developed her own tools for this work: repurposed brooms and a giant, homemade horsehair brush. 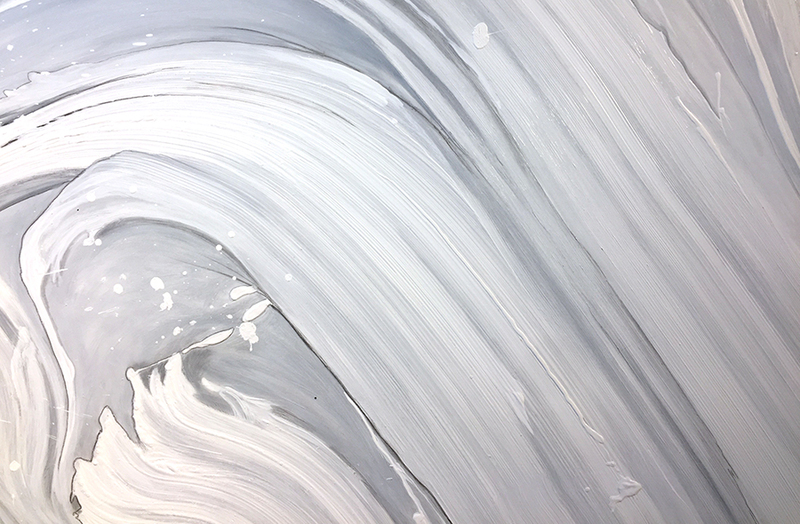 Her paintings are records of action, of forces both purposeful and accidental — strong, intentional strokes and their accompanying splatters, where a brush thick with wet paint impacted the panel. Cosmology is, in part, the study of our universe’s “beginning” (if you can even call it that). Here, Simon-Casati’s paintings begin not with a big bang but a big splat, recorded on each panel before trailing away and out of view. 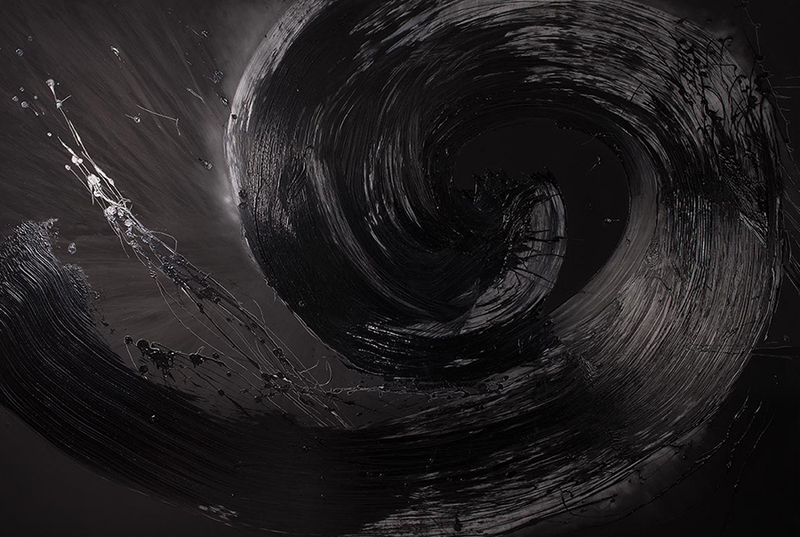 Spiral, for instance, is just that: a single, powerful motion, like a mighty Charybdis or a wet black kiss from Fibonacci himself. It stares you down with the fearsome, impersonal power of a force of nature. After Simon-Casati’s mother passed away in 2011, the artist wondered where the energy of a human life went after death. She eventually became interested in particle physics and, in a moment of curiosity, reached out to Dr. Liliya Williams, an astrophysicist studying dark matter at the U of M. The two struck up a friendship, sharing notes about art and physics over months of conversation. Dr. Williams was so impactful on this exhibition that the artist invited her to be part of both her artist talk and a panel discussion of the work. A quick primer on dark matter, as I understand it: over the past two decades, researchers have discovered strange phenomena in the cosmos, the apparent results of unseen forces. The hypothesis is that there is a certain amount of invisible matter out there (and right here around us, as well) that is only detectable through its gravitational effect on celestial bodies and the photons they emit. In a pie chart of the matter & energy content of the universe, this “dark matter” makes up about 23% of the whole, while visible matter is just a sliver at 4%. The other 73% is so-called “dark energy,” which is thought to essentially be an anti-gravitational force of its own that is not only pushing galaxies away from each other but accelerating their travel through space. Dr. Michael Turner at the University of Chicago explains that this acceleration could lead to a number of eventualities: galaxies so far apart that fewer stars would appear in the night sky (not that we would still be around to see them by then), a slow-down and recollapse of the universe ("the big crunch"), or perhaps even a ripping apart of space and time itself ("the big rip"). Throughout art history, a painter’s brushstroke (or lack thereof) has often been their signature. Think of van Gogh’s thick impastos or Seurat’s precise pointillism. In the mid-20th century, a whole movement built up around the importance of a painter’s interaction with their materials. The works of art were documents of the Abstract Expressionists’ emotions through their actions: their gestures, their strokes, their splatters. The goal was purity of aesthetic and intention, stripping painting down to a universal visual language. (Although, as Andrea Carlson points out, this “universality” came from a predominantly white and male perspective.) The expressionist brushstroke was even made into an overwrought joke by Pop artist Roy Lichtenstein, thumbing his nose at the self-important art heroes of the previous decade. Nevertheless, Smashing the Invisible continues this investigation of the brushstroke, calling to mind the bold and assertive work of Franz Kline and Joan Mitchell. 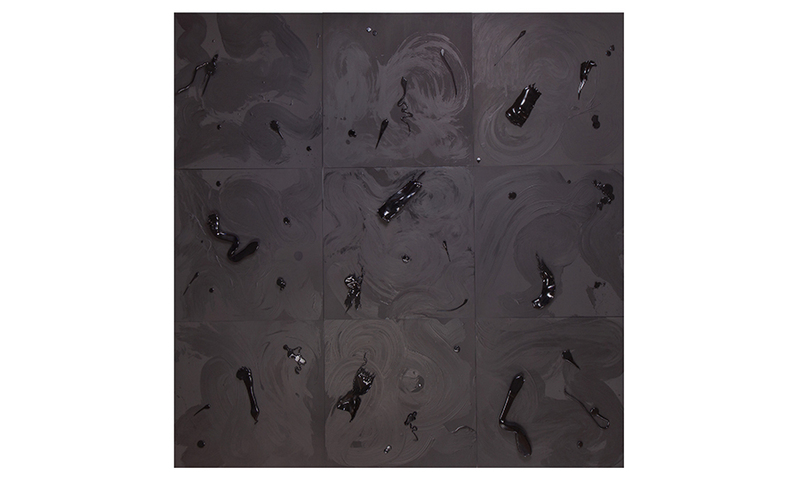 One piece, Dark Matter, even brings some of Simon-Casati’s strokes into the third dimension in the form of black glass. 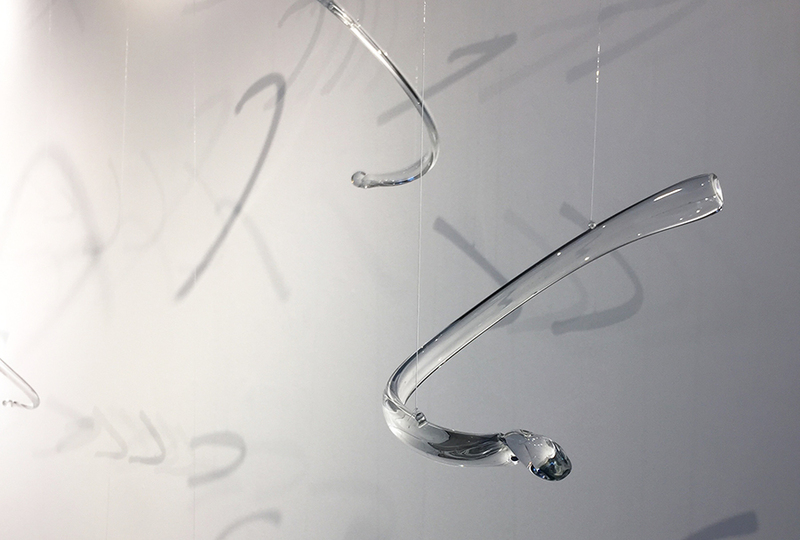 There is also an installation of individual glass ribs hanging from the ceiling, fragile and delicate, casting an ever-moving drawing of shadows on the walls like quick flicks of the wrist. For a moment, I thought of Adam’s rib and that first divine surgery in Genesis, but Simon-Casati insists that religion played no role in this work. “Maybe spirituality,” she allows. I don't entirely agree with that last part. It seems to me that artists and scientists, like all of us, share the same reality: cosmologically, biologically, politically, and otherwise. Where science seeks to understand and quantify the world around us, art is a reaction to that world. For her part, Dr. Williams expects that we will, sooner or later, answer the question of just what dark matter is. Here Simon-Casati draws another distinction between the two disciplines: “The last thing an artist wants is total clarity.” And for as black and white as this show may appear, there is a great abundance of grays to be found as well. Smashing the Invisible is currently on view at the Quarter Gallery at the Regis Center for the Art-East through February 10th. The gallery is open Tuesday - Saturday, 11am - 7pm. For more info, visit the artist’s website at www.mscasati.com.